When it comes to style, there is something to be said for the classic, traditional look. I mean, it's timeless for a reason, right? However... what about expressing some personality? Something to show off your individual uniqueness? I love finding just the right accessory for an outfit to give it a little something extra and move it from the ordinary to the extraordinary. And one of the cutest shops around to do just that is none other than the handmade, stylish, unique creations you'll find at Blushing Dove Boutique. 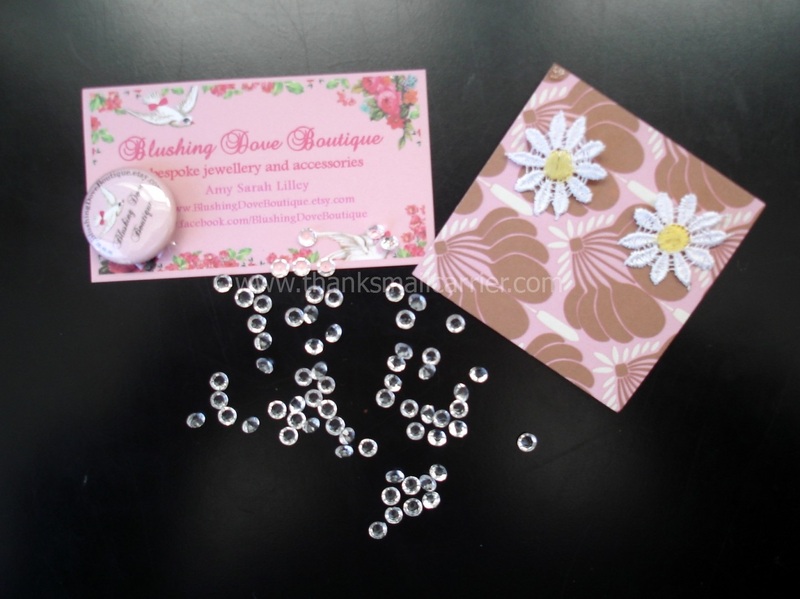 With everything from handcrafted kawaii headbands, necklaces, earrings, rings, bracelets, brooches, amigurumi and much more, Blushing Dove Boutique is your one-stop shop for the jewelry and accessories that range from subtle to head-turning. I love the idea of adding a pretty, feminine touch to otherwise standard apparel and making an outfit your own. How fun would it be to take something simple like jeans and a t-shirt and completely give it some pizazz with the Blue Ostrich and Peacock Feather Headband or the Springtime Butterfly Headband? When the Daisy Lace Stud Earrings from Blushing Dove Boutique arrived, right away I loved the simplicity yet uniqueness that these would add to my wardrobe... not to mention how fun it was that they arrived complete with an adorable magnet and sparkly crystal accents in the package! In person these sweet earrings are just as cute as they are online. The delicate daisy lace is detailed and attractive while still being securely attached to the stud backings so there is no chance of damage or loss. Slipping these on, I was happy to see that the size is substantial enough to add that taste of cheerful spring while not being too large that they would draw more attention than I wanted. 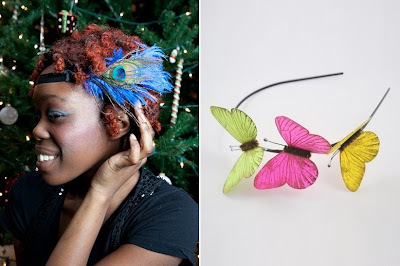 Amy at Blushing Dove Boutique has found a way to turn common accessories into unexpected pieces that are sure to be treasured additions to the jewelry boxes of girls and women of all ages. 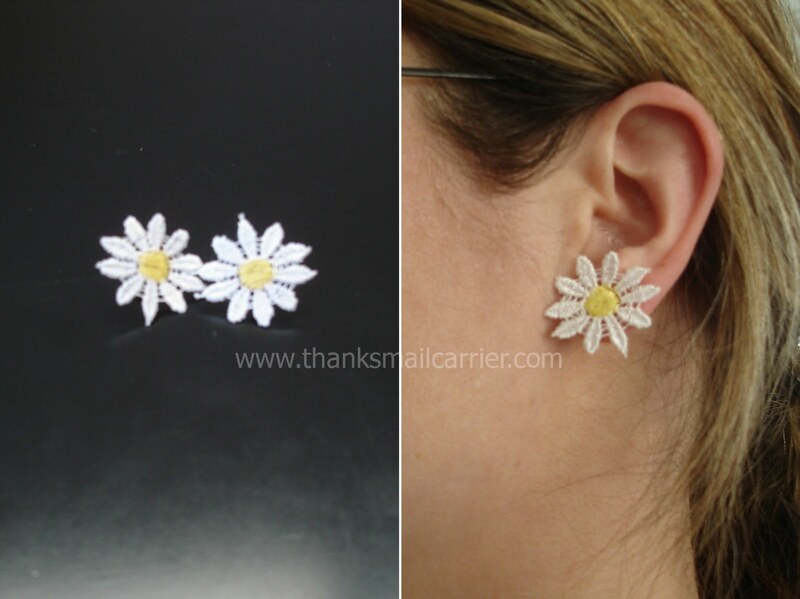 Her extremely reasonable prices (these Daisy Earrings are only $4.95) and one-of-a-kind fashions make it easy to include your own distinctive style to anything from casual to dressy occasions. Amy has even taken her creativity one step further and has a second shop, Teacup Teddies, that offers handmade miniature bears and animals. So, if a cute little critter is more your thing, you won't have to look any further! These petite creatures would be a great addition to any collection, display or set of sweet animals for anyone. When you combine artistic talent and vision with high quality and detailed workmanship, the result is completely individualized fun! Blushing Dove Boutique has found a way to do just that and bring it all right to your door in an inexpensive way. What a perfect mixture! To enter to win: Visit Blushing Dove Boutique and tell me the name of your favorite item. 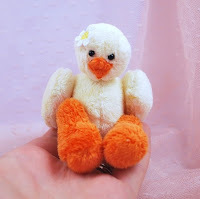 1 Extra Entry (per method) if you follow Blushing Dove Boutique on Twitter, Like them on Facebook and/or follow the Teacup Teddies blog with Google Friend Connect. 1 Extra Entry (per method) if you visit Teacup Teddies and tell me the name of your favorite item there and/or visit Amy Lilley on Artfire and tell me the name of your favorite item there. Giveaway will end on March 18th at 11:59pm CST. Do me the favor of leaving an email address or making absolutely sure it is visible in your profile, I have to have a way to contact the winner. The winner will be chosen by random.org and announced here as well as emailed and will have 48 hours to contact me or respond to notification or a new winner will be chosen. This giveaway is open worldwide! If you're reading this then you can enter! A big thank you to Blushing Dove Boutique for providing Daisy Lace Earrings for me to review as well as a $15 gift certificate for one lucky giveaway winner. The opinions shared are my own and honest and if you really need to see more, click here to see how I roll. I like the Crocheted Russian Doll Hair Tie! love love love the Hello Kitty Cameo Feather Clip!!!!! I love their Love Necklace. my daughter would love the Disney Princess Necklace! I like Itsy Silver Sequin Flower headband. The Baby Charms Necklace is so much fun! Thanks for the lovely giveaway. My favorite is the Fabric Flower and Lace Forehead Head Band! entered the Fake Bake giveaway. from Blushing dove i like this item http://www.etsy.com/listing/50748654/pearl-flower-earrings. followin blushing dove on twiter as jozeeandleeb. i am an old follower of tea cup and teddies. love the Jolly Oriental Cat necklace. I love the pearl flower ring! entered the Fake Bake g/a. I like White Sequin Flower Forehead Band. I like Handmade Miniature Pink Bear Coral. I love feather head bands, and the Blue Ostrich and Peacock Feather Headband was my favorite item from the shop. Following Teacup Teddies blog with GFC. My favorite item from Teacup Teddies shop was The Handmade Miniature Jointed Unicorn Whisper. I'm following you...through Google Face Connect. I like the Love Necklace in Silver! follow the Teacup Teddies blog with Google Friend Connect. My favorite item from the shop is Springtime Butterfly Headband. I am a follower of Blushing Dove Boutique on twitter as violet_porto. My favorite item from Amy Lilley on Artfire is Flying Bird Drop Earrings. i am a fan of yours on Facebook as viorela violet. I like the Love Necklace in Silver. The Pepe Le Pew hair clip. I like THE CUTE CUPCAKE RING! I entered the Snazzy Baby giveaway. I really like the Springtime Butterfly headband!